Wonderful open living spaces with wide windows or bifold doors enhance our homes, allowing light to flood in. But if you choose to have curtains over these wider than average expanses then you may have found it difficult to find extra long curtain poles or curtain tracks which will work as you want them to work. Take a look in DIY stores or high street retailers and it’s likely that the maximum size of curtain pole you can buy is just not long enough for your requirements. And it’s not just the length of pole that needs to be right. The all important means of supporting the pole can also put your head in a spin. How tall will the brackets be and where can they be positioned? Can you fix the pole or track to the wall, or can it be fixed to the ceiling? Are you hanging a pair of curtains which draw to the centre or would you like to be able to pull the curtains back to one side? Oh, and is there enough space for a pole end (also known as a ‘finial'), or would a recess bracket fixing better meet your needs? And if you have your heart set on a certain colour to complement other features in your room the challenge becomes even greater, or so you would think. But thank goodness for companies such as Jones Interiors and Hallis Hudson who have designed ranges of curtain poles which can be purchased in component format to meet your custom requirements with ease. Lunar and Strand by Jones, and Neo by Hallis Hudson have the answers! Passing rings and passing brackets are the key to achieving long, long lengths when hanging curtains with heading tape, and where fitting space above windows is limited, you need neat, strong, space saving brackets, and yes, they have those too. And if you prefer to have eyelet curtains you may well be looking for long single piece poles (because eyelets can’t pass brackets). Jones Interiors have a useful 300cm pole length in Chrome and Matt Nickel in their 28mm Lunar range, and Hallis have a 500cm pole length in Satin Silver in their Neo ranges. End stopper finials on curtain poles are so popular, and for several reasons. Their dimensions mean they fit neatly into small areas, so if you have limited space to the side of your window where the curtain will hang, this design could be really helpful. 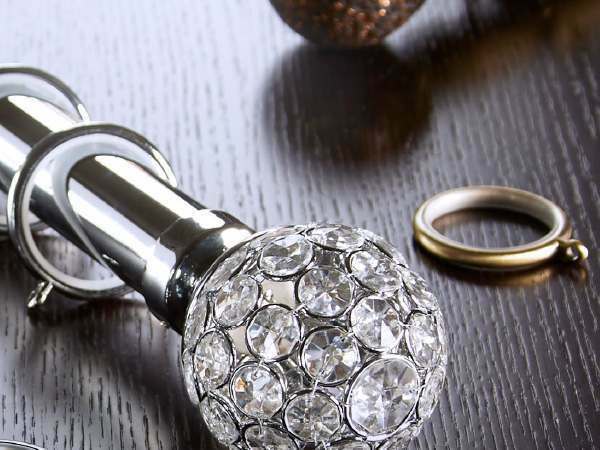 End stopper finials are neat and discreet – when you want your curtain pole to work well, be understated, and yet look amazing within contemporary or more traditional décor, End Stoppers are an ideal choice. In the popular 28mm diameter ranges don’t miss the End Stopper in the Lunar range by Jones Interiors, in a choice of Matt Nickel, Chrome, Gun Metal and Burnished Brass, or the Lunar End Cap in Oak. These poles are fantastic quality and have really stylish cylinder brackets to complete the minimalist appeal. Jones also have their well priced Astra 28mm range which features this very popular pole end style, comes in Chrome and Matt Nickel and starts at only £21.45 for a 120cm pole set. Another neat 28mm end stopper pole end is Ronda by Integra, and this also has the cylinder bracket style and is available in Gloss Black or Gloss White. Bright white or deep black colour finishes in curtain poles are otherwise quite difficult to find. 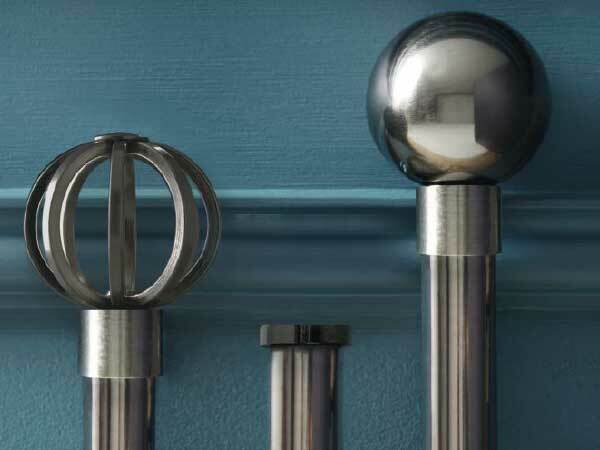 Swish Elements Stud curtain poles come in 28mm and 35mm in a choice of Satin Steel, Chrome, Antique Brass and Graphite. Swish also have a 19mm version of this design in the same colour ranges. The Ribbed End Stopper by Jones Interiors is part of their 35mm Strand range. It’s a bit wider than the Lunar End Stopper, and is a little more detailed with its three tiered design and comes in Matt Nickel, Chrome, Black Nickel and Satin Brass. 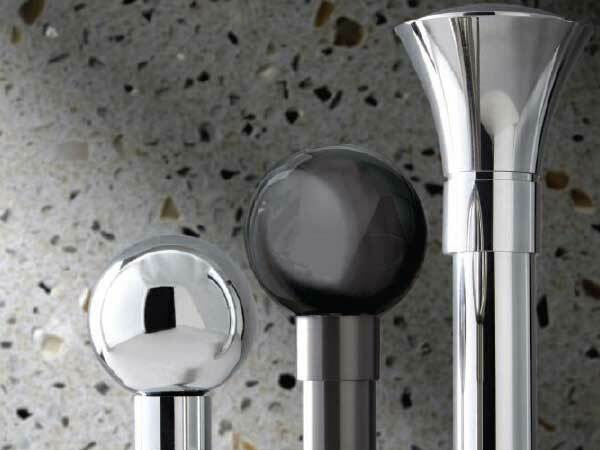 Hallis Hudson have included an End Cap design in their Rolls Galleria Metals 35mm and 50mm ranges in Brushed Silver, Chrome, Burnished Brass and Black Nickel. This range has stylish lateral brackets. And in wood, the 45mm Modern Country range by Rolls includes a lovely, neat Button finial in a choice of seven beautiful colours. One last word on the End Stopper! If you are considering this design because you are limited on space, then another option may be to use recess brackets at one or both ends. Recess brackets fix neatly to the side wall and support the pole right on the end. This type of alternative support bracket is available in many of the ranges and enables the curtain to be pushed back as far as possible.